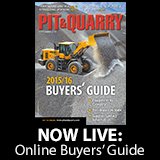 P&Q’S Kevin Yanik details a busy first quarter and offers some perspective on the evolving aggregate industry. S-C Market Analytics’ David Chereb offers his latest aggregate forecast. Volvo Construction Equipment (Volvo CE), Telia and Ericsson launched Sweden’s first 5G network for industrial use at Volvo CE’s facility in Eskilstuna. S-C Markets’ David Chereb provides his latest aggregate forecast. NSSGA, NAPA and AEM leaders come together to discuss the challenges and opportunities facing the related industries. Safety awareness starts when an aggregate producer initially purchases a piece of equipment for a plant.